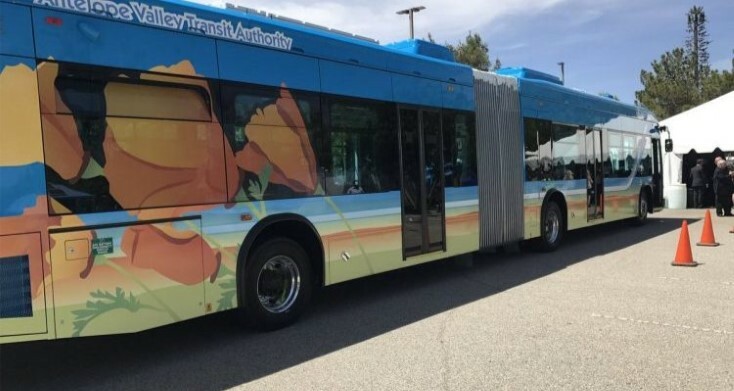 AVTA plans to operate its newest 60-foot articulated all-electric buses on these new routes. LANCASTER– The Antelope Valley Transit Authority is expanding its commuter routes to include local aerospace employers Edwards Air Force Base and the Mojave Air and Space Port. AVTA’s board of directors approved the new Employment Center Commuter Services in September, and the agency has been working to finalize routes and fare structures, officials said in a news release. Transit customers can learn and ask questions about the new services at a public meeting scheduled for 4:30 p.m. this Tuesday, Nov. 20, at the Rosamond Community Services District, located at 3179 35th Street West in Rosamond. The meeting will begin prior to the regular meeting of the RCSD Board of Directors, and is open to the public. AVTA officials will also give a short presentation during the actual board meeting for those unable to attend at the earlier time. AVTA’s new Route 747 will serve the Edwards Air Force Base Installation and 412th Test Wing, which currently employs more than 10,000 personnel. Route 748 will run to the Mojave Air and Space Port, home to The Spaceship Company, BAE Systems, Scaled Composites and Northrop. Both routes will begin in the Antelope Valley, with the 747 making a stop in Rosamond, before reaching their final destinations. AVTA plans to operate its newest 60-foot articulated all-electric buses on these new routes. The buses are 100 percent battery powered and offer free on-board WiFi. AVTA is working to develop similar programs with the Air Force Plant 42 Production and Test Facility in Palmdale and employment centers in Santa Clarita. 11 comments for "Public meeting Nov. 20 to discuss commuter service to Edwards AFB, Mojave Air & Space Port"
The issue is whether a large enough number of aerospace workers will utilize the services on offer to justify the routes and expenses. I used to work at a remote site operation of similar size. The DoE ran an extensive service of buses, and hardly anyone drove their cars to work. Admittedly, riding those buses was provided outright as part of compensation to employees, so there was a really strong incentive to use them rather than pay to drive, but it can work. Scheduling times and frequency will never work. Electric buses will fail on long routes; should be used in the cities.This will never work. Guaranteed! At least the officials in Albuquerque were smart enough to dump those subpar BYD busses. It must be nice to have elected people looking out for you instead of their own wallets. @Van D – how do you know AVTA is planning to use BYD buses? I didn’t see it in this article, and the bus in the picture looks different than the Albuquerque buses. AVTA is going all electric and they are buying all BYD busses. So comforting to know our elected officials are thinking of the taxpayer. Overpaying for inferior product. Such is life in under the Wrecks regime. The City of Albuquerque has declared their new BYD buses (made in Lancaster) unsafe and poorly made. Granted this is only an accusation. But the Antelope Valley Transit Authority needs to immediately determine if there is any truth to the accusations. Our local buses usually run mostly empty but every passenger needs to be safe. Is the origin not determined yet? Antelope Valley is quite vague. Especially considering that both Rosamond and Edwards are actually in the Antelope Valley. Seriously though, these routes will almost certainly originate either from the Lancaster transfer center or they will originate from the Palmdale transfer center with a stop at LTC.